Ladder Planters - For a great space-saving effect that adds functionality and beauty to your fence, add planters in a ladder formation to your fence for growing herbs, or any other plant that strikes your fancy. On lower levels, consider growing flowers like orchids, who can use the shade of your fence and the other planters to stay out of direct sunlight. Bird Houses - Want to add pops of color and your very own nature show? 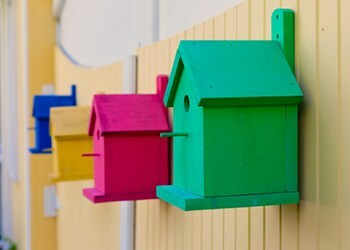 Colorful bird houses are a simple, fun way to have both! Arrange them at different levels and in various sizes, add some birdseed and voila! Nature-friendly way to spruce up your backyard. Fairy Lights - For a bit of magic, while enjoying a night outside under the stars, a simple box of fairy lights brightens up your fence and adds ambiance and calm at the end of a hard day. So, next time you’re taking a look at your backyard and wondering how you can brighten it up, look no further than your own fence! For more awesome ideas on how to spruce up your fence, click here.